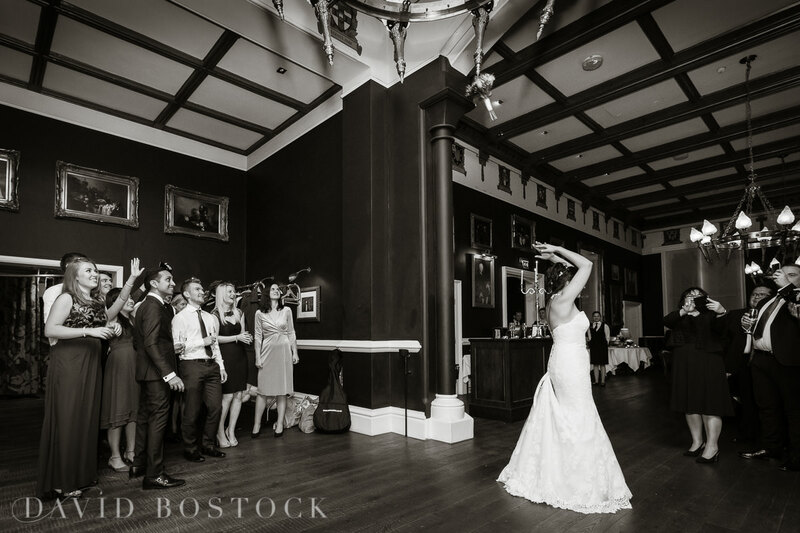 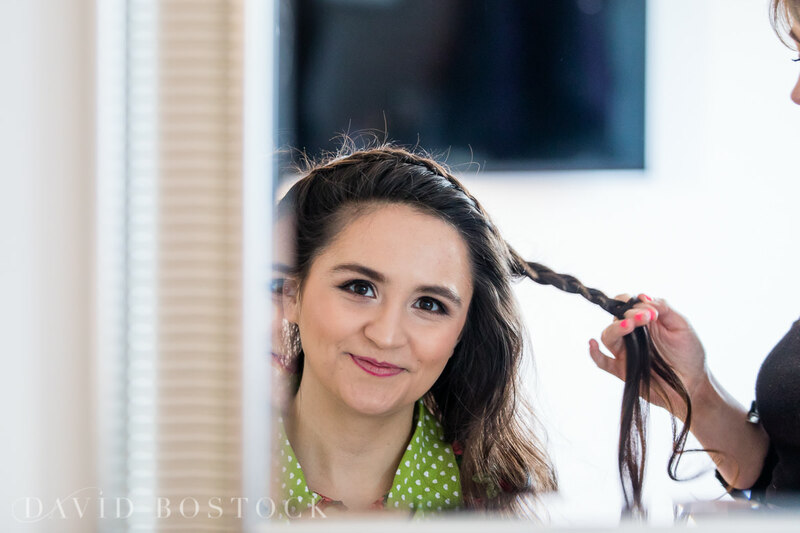 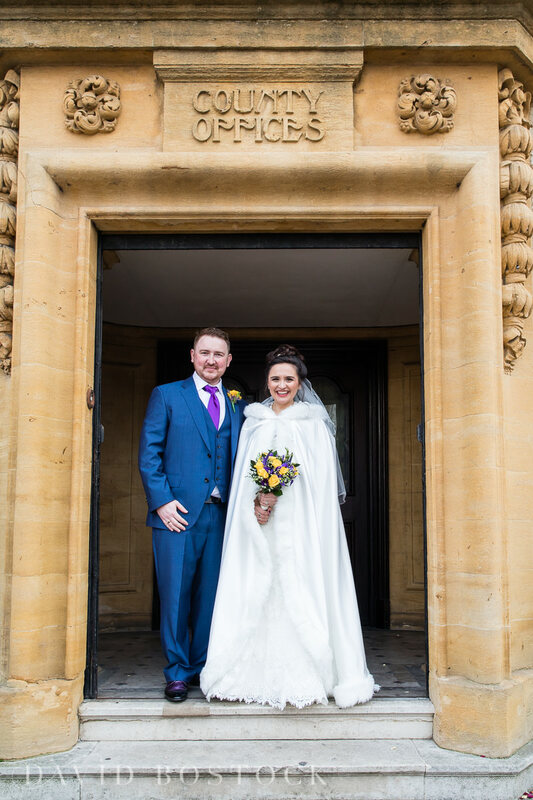 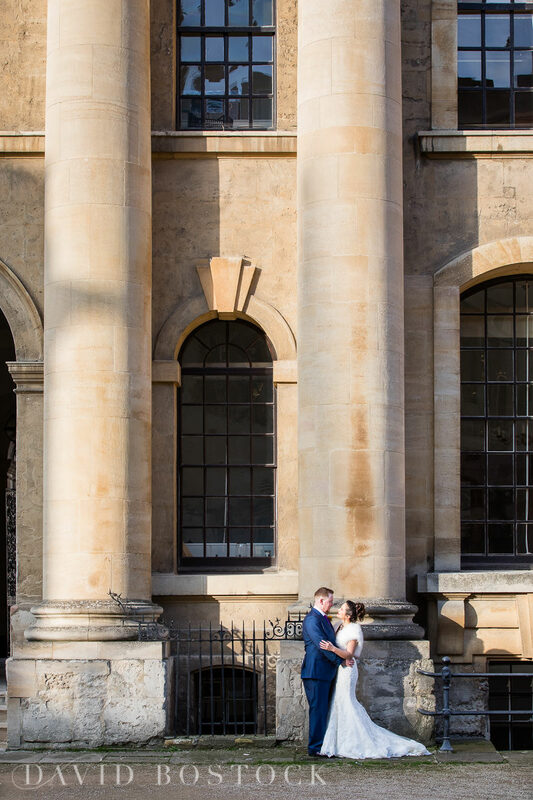 Oxford in winter is magical, especially on a crisp, sunny day – and Ava and Filipp’s January wedding at Hertford College was no exception. 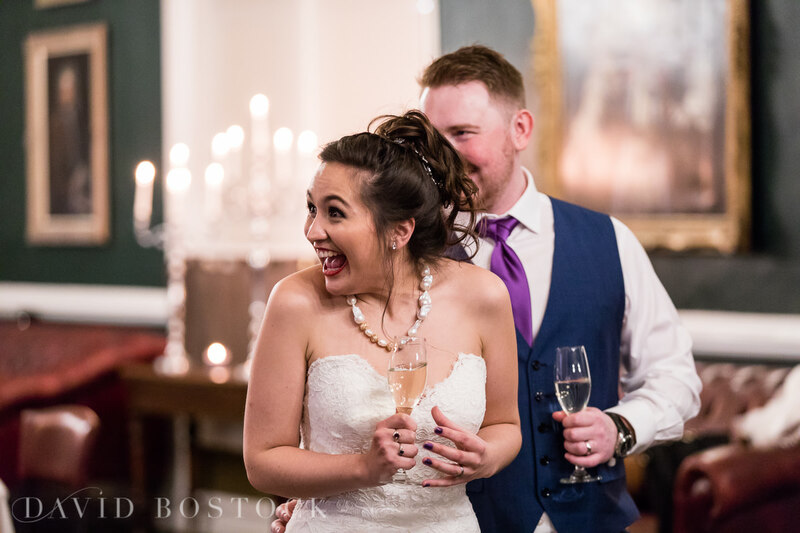 Intimate, sophisticated and full of laughter, it was a really memorable celebration. 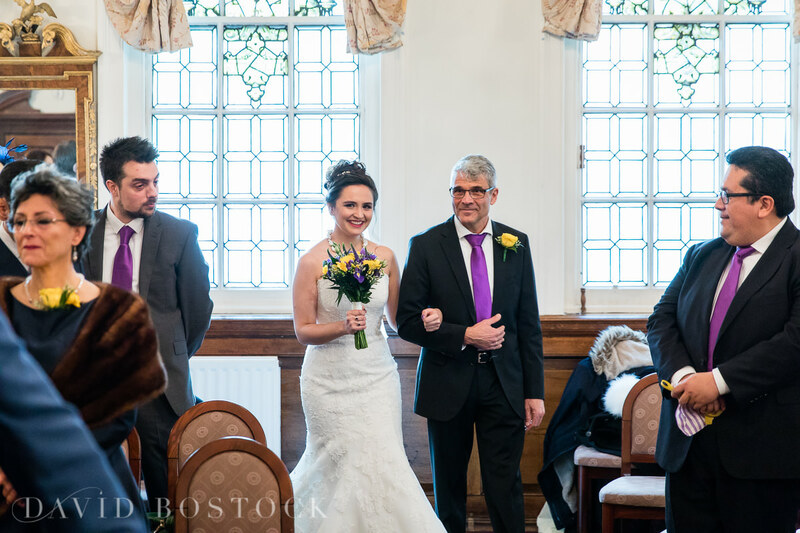 Ava, the bride, is from South America, and her parents are both German, while Filipp’s mum is Russian. 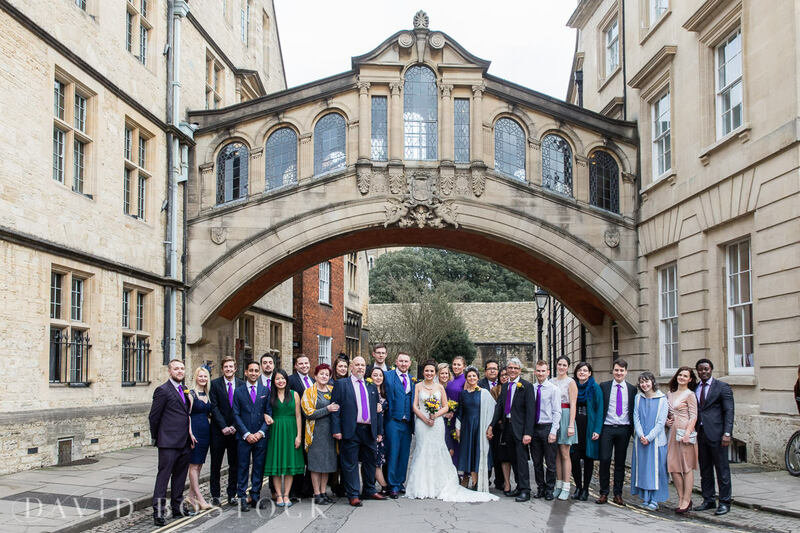 As a result, the day had a really international feel, with lots of overseas guests and several languages being spoken throughout the day. 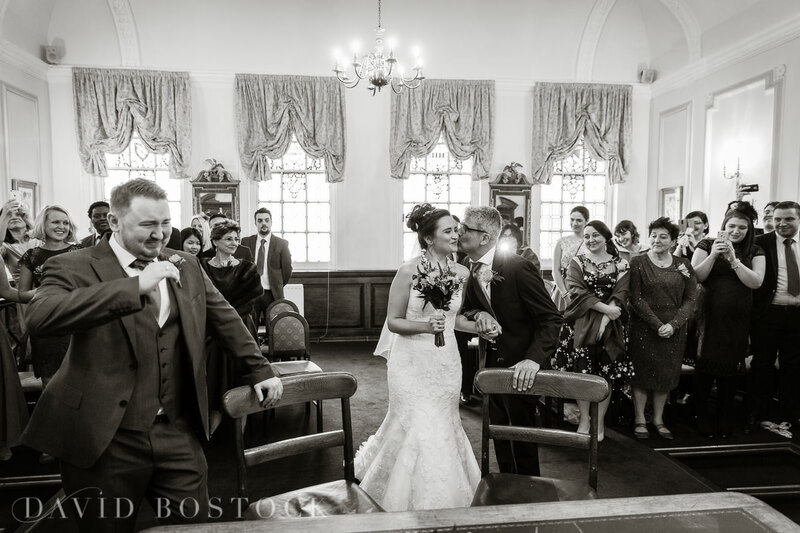 Such a great atmosphere and plenty of emotion! 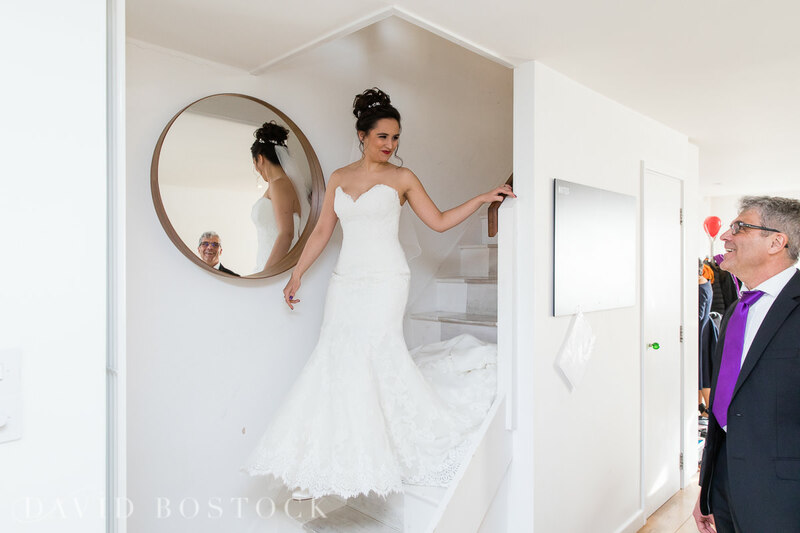 One of my favourite moments to capture was when Ava was coming down the stairs to see her dad. 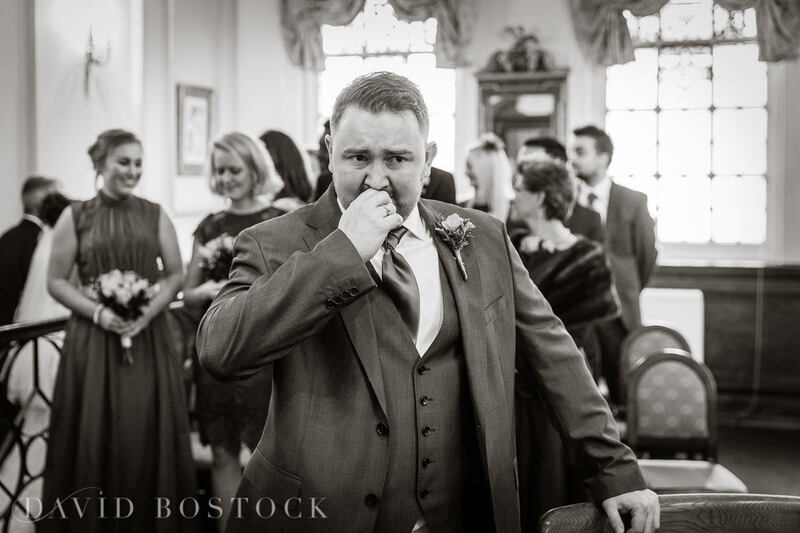 The reflection of his face in the mirror, as he sees Ava in her wedding dress for the first time, is absolutely priceless. 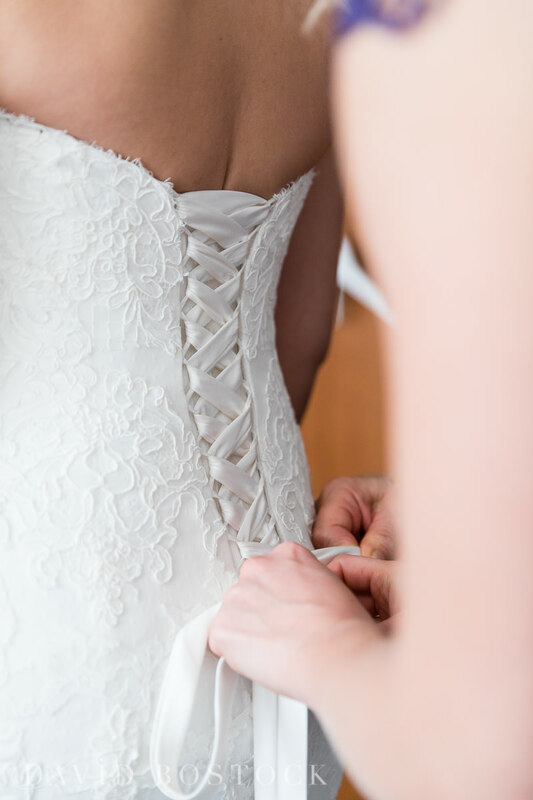 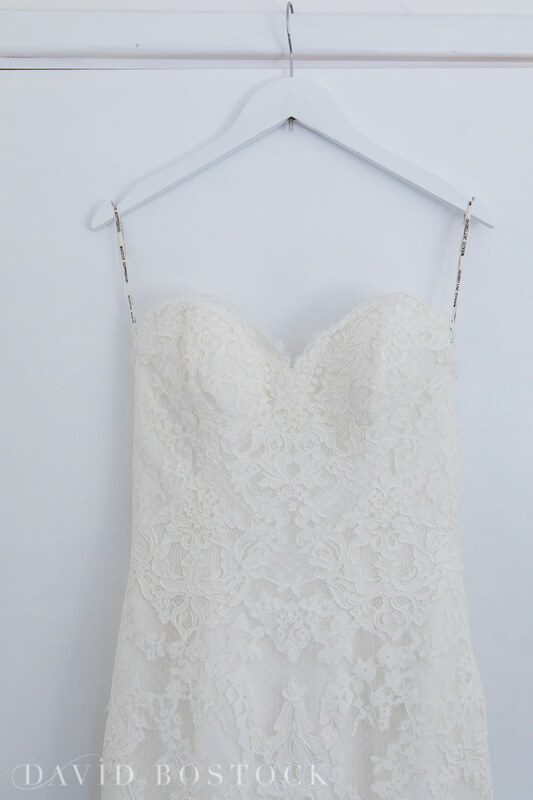 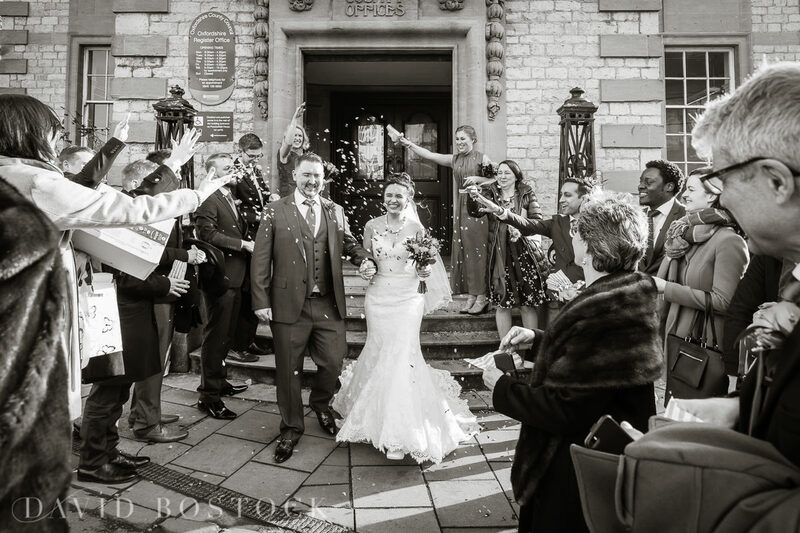 The bride looked super-glam in a strapless, sweetheart neckline, lace Maggie Sottero gown, with sweeping train. 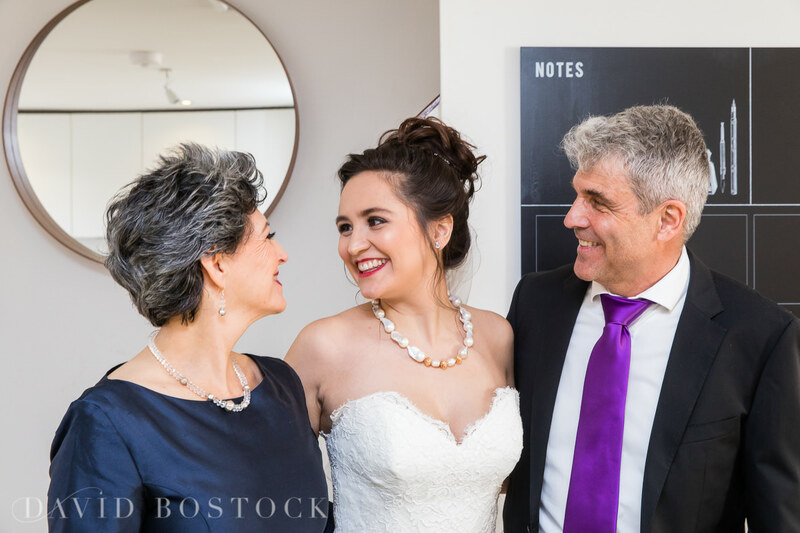 She paired this with some classic ivory satin court shoes from Rainbow Club, sparkling hair vines, Swarovski stud earrings and a stunning, heirloom necklace from her father. 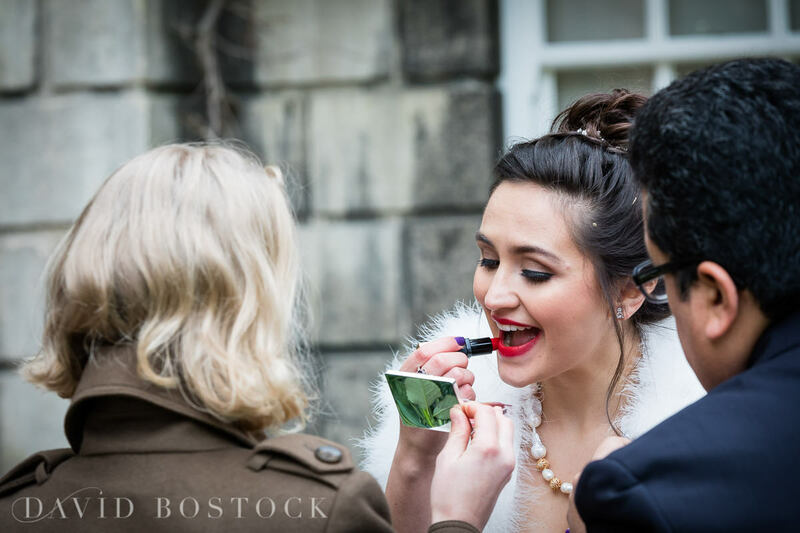 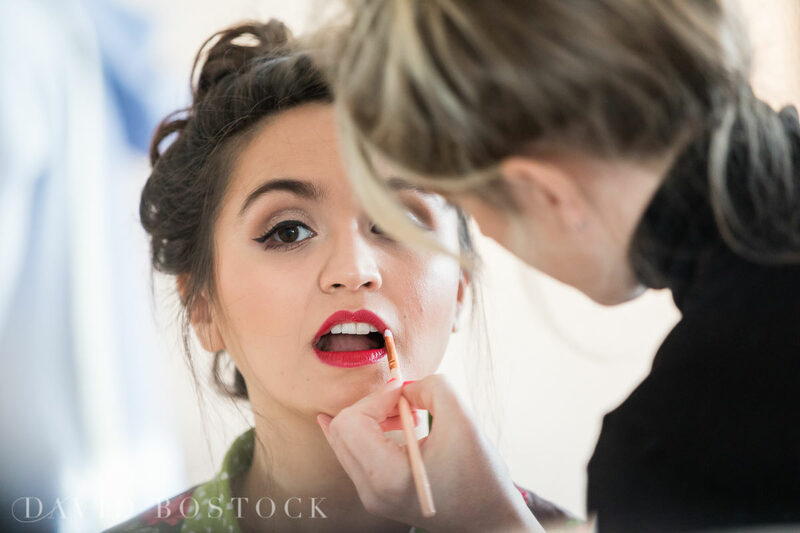 A bright red lip and yellow and purple colour-pop bouquet, finished off Ava’s Old-school Hollywood look – gorgeous. 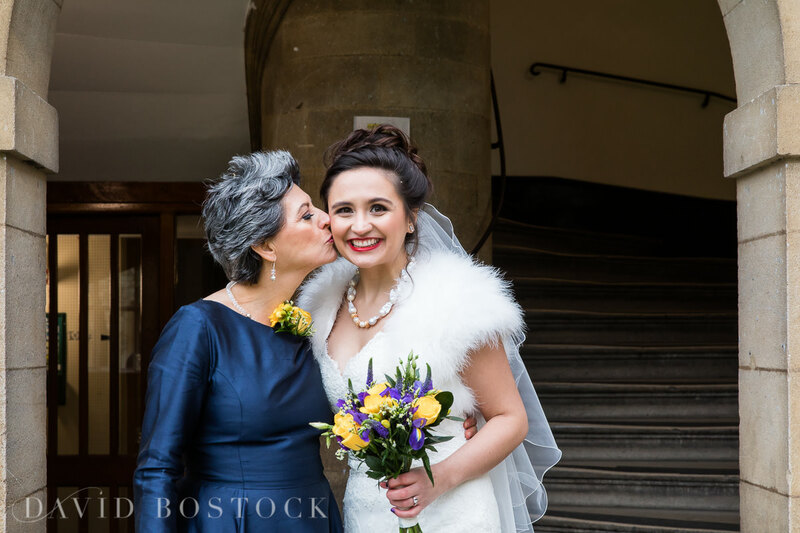 Although the wedding was in late January, it was a beautiful, sunny day – Ava kept the chills away with a luxurious fur cape. 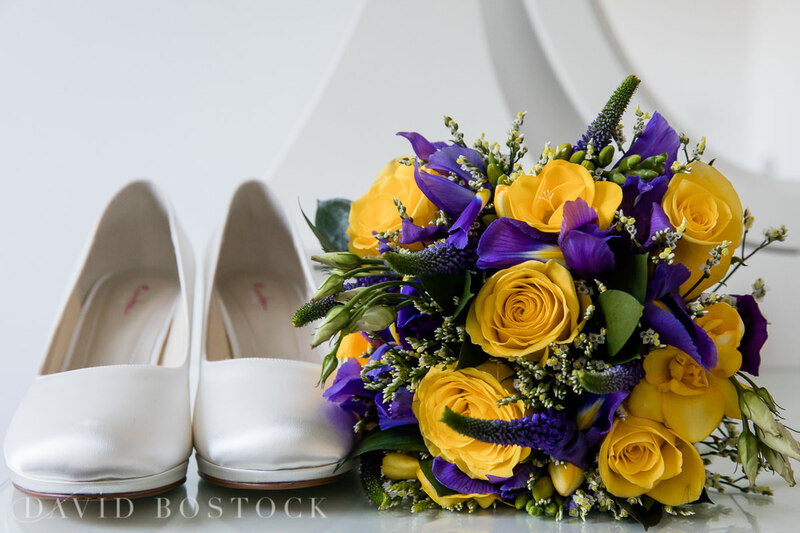 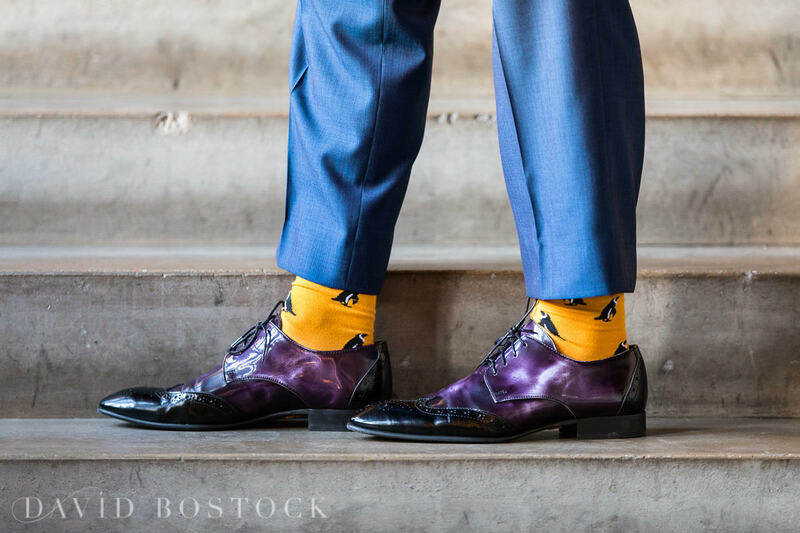 Filipp looked smart in a blue suit, with a vibrant purple tie and yellow rose buttonhole to match Ava’s bouquet – not to mention the best socks I’ve shot to date (yellow with penguins!) 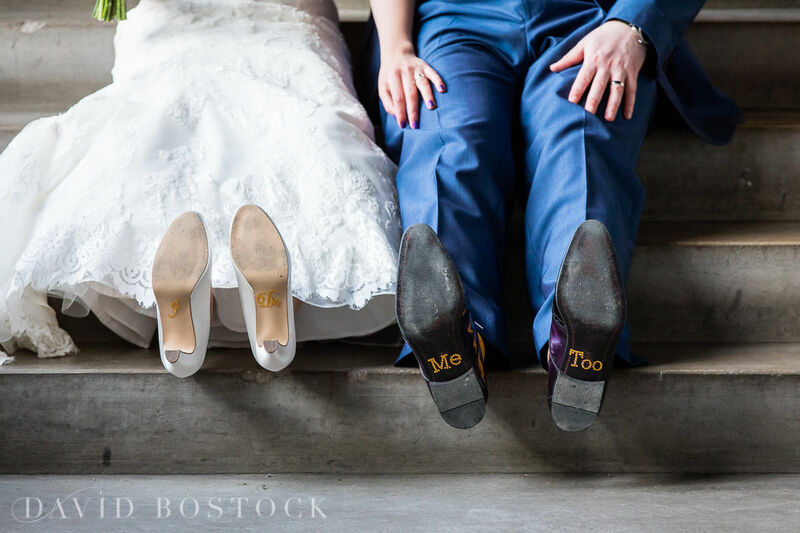 and cool purple brogues. 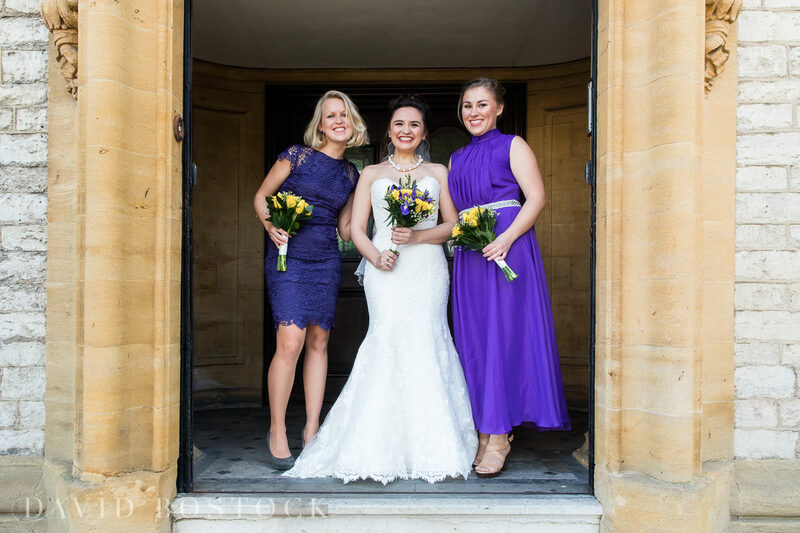 The bridesmaids wore mismatched dresses in bright purple, so they could show off their own personal style. 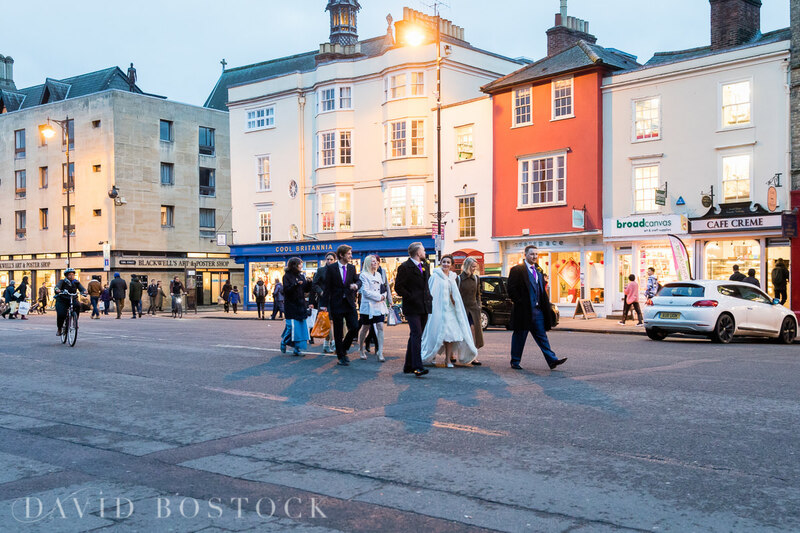 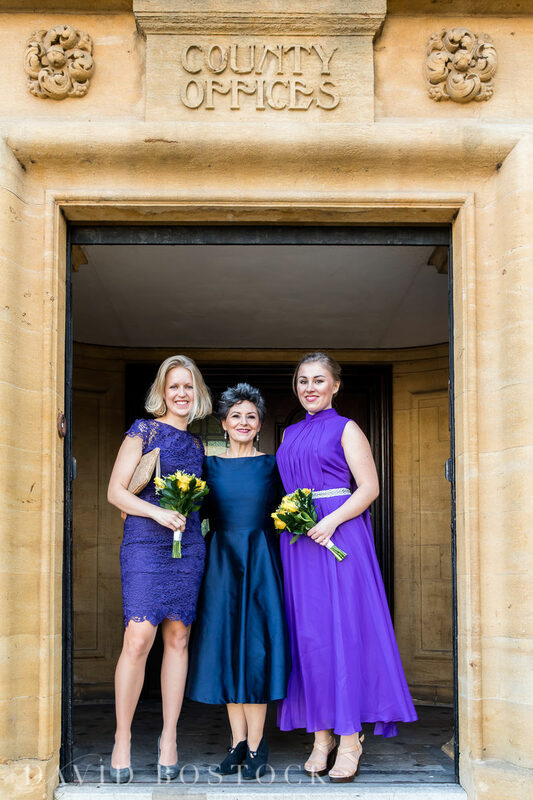 All the colour made such an impact as the wedding party walked through the streets of Oxford! 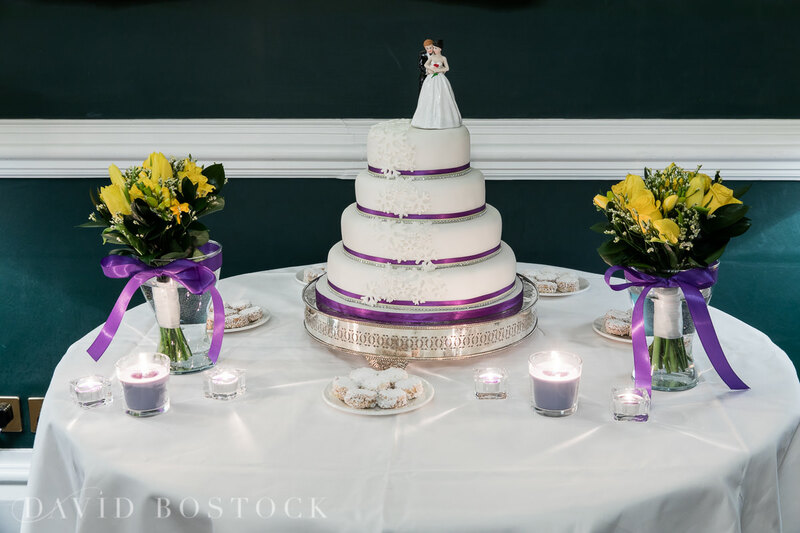 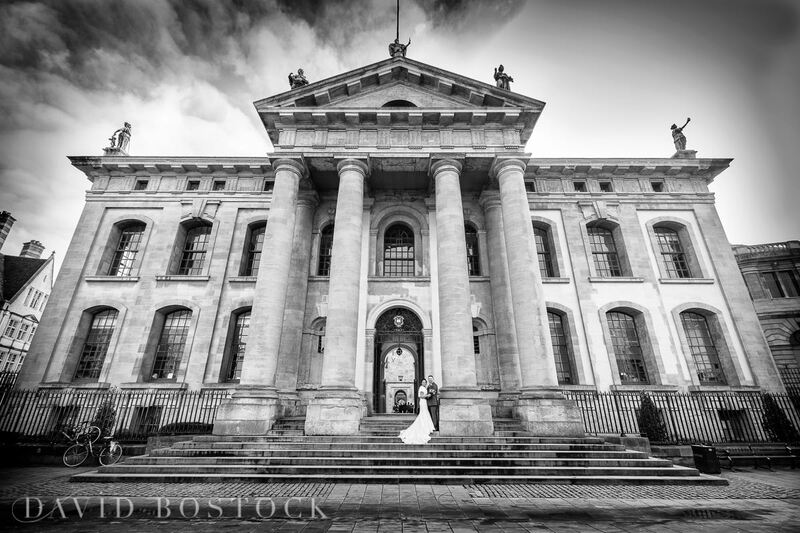 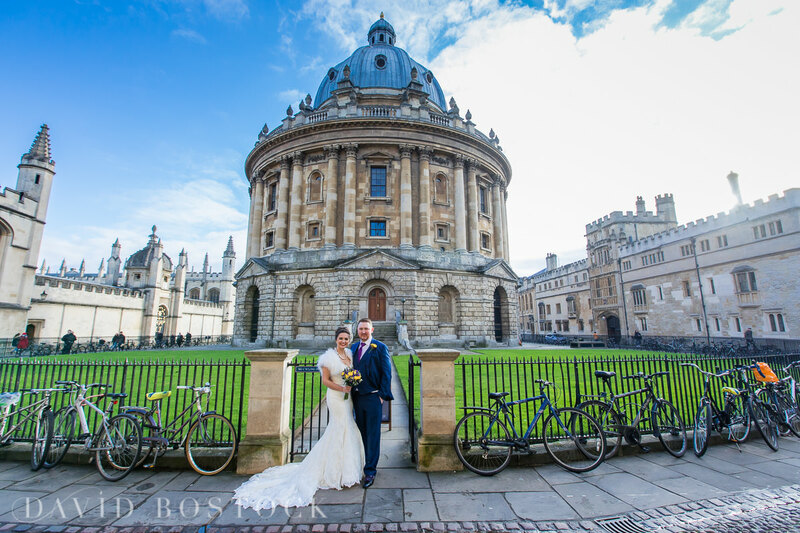 The couple got married at Oxford Registry Office. 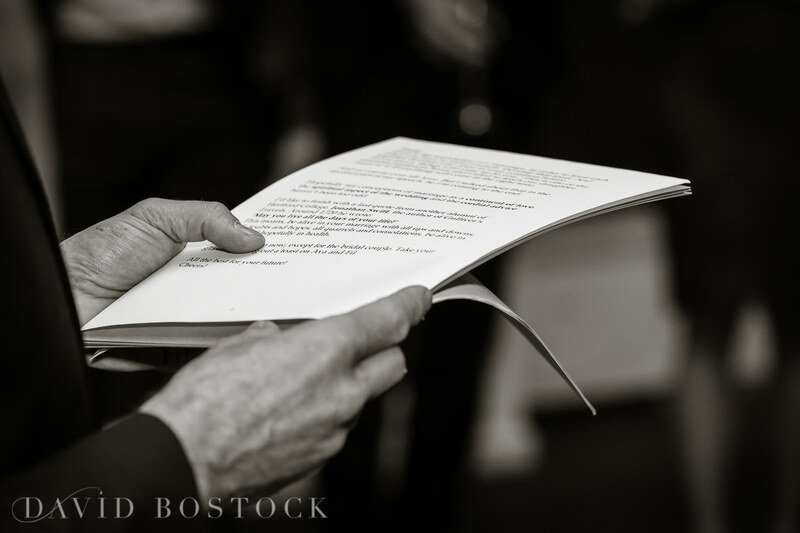 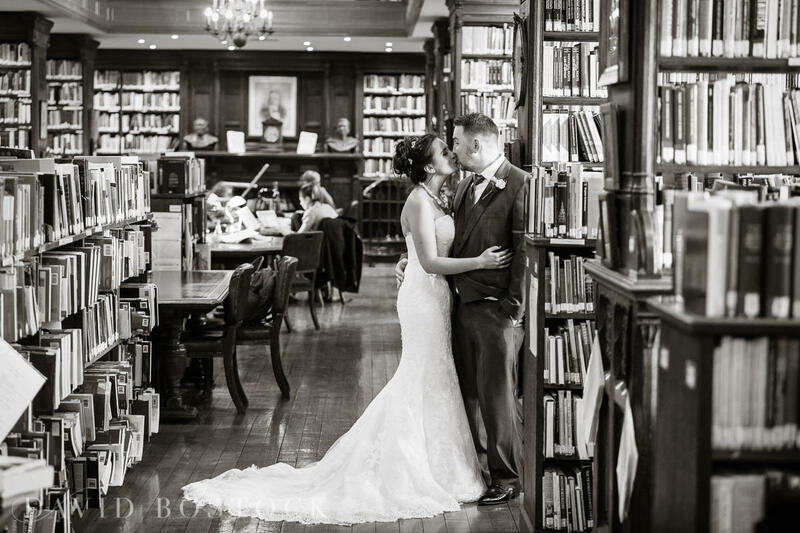 It was my first time photographing a wedding here, but I really enjoyed it. 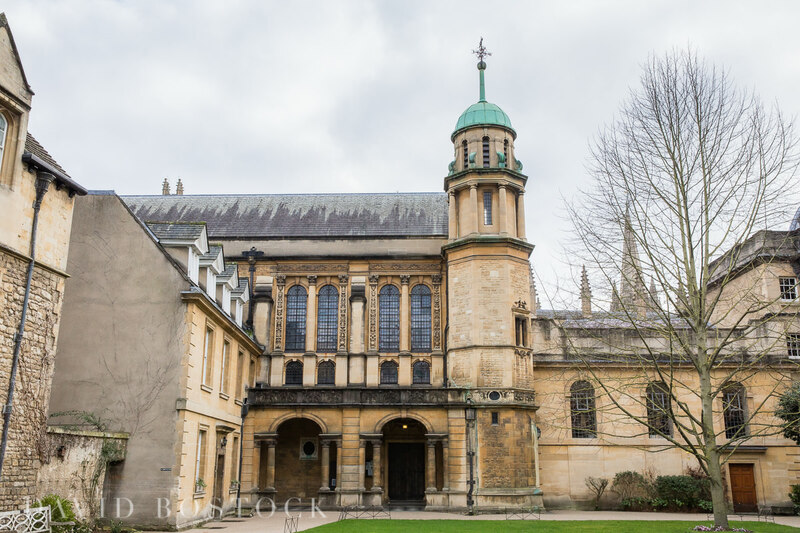 It’s very nice inside, not to mention sitting right in the heart of Oxford. 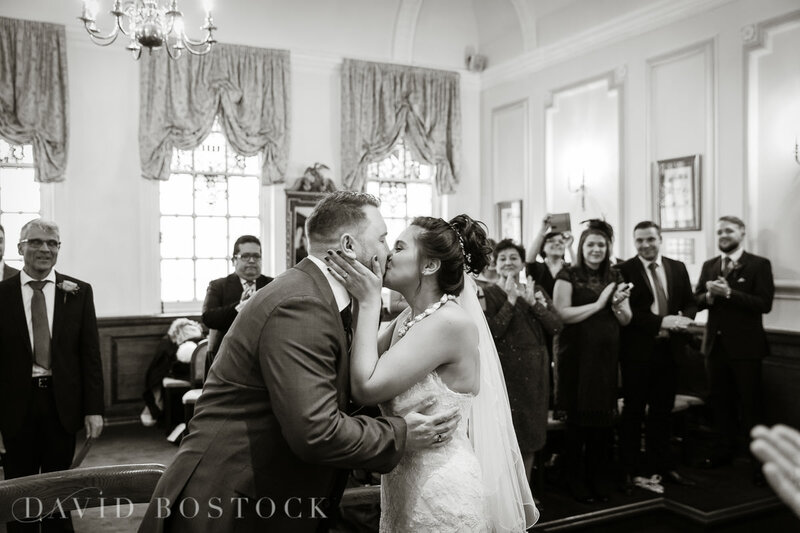 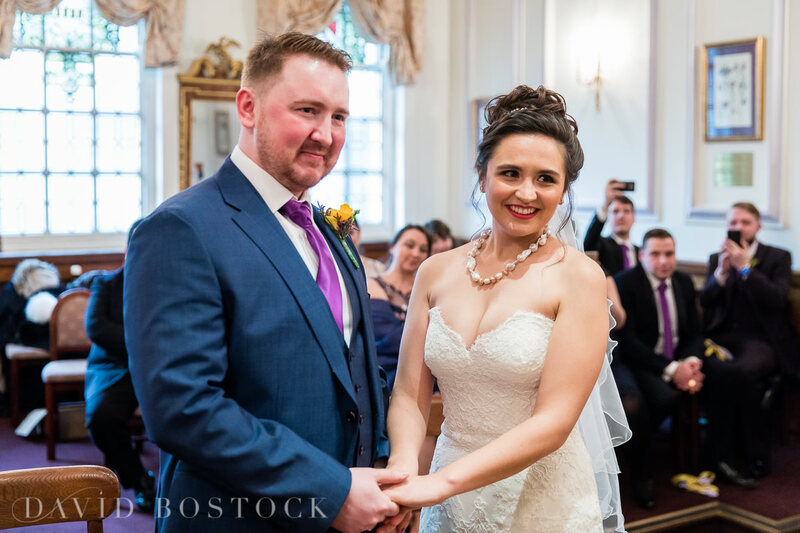 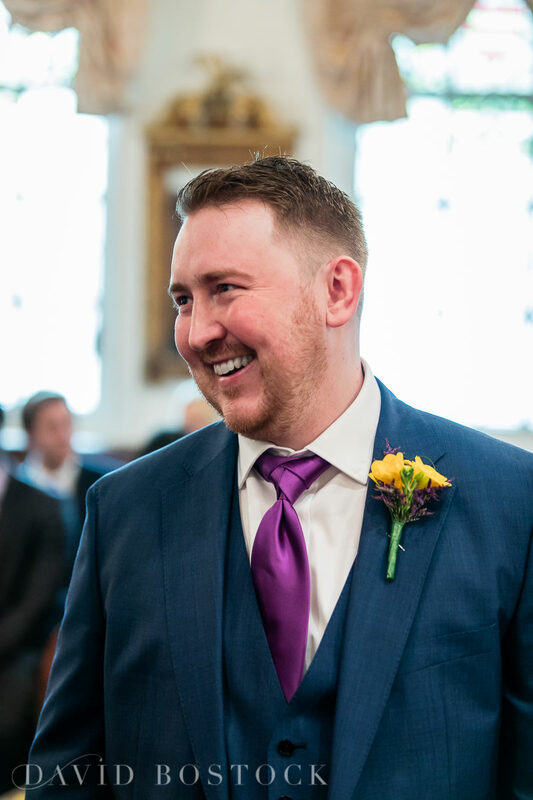 Filipp was an emotional groom and completely lost it as Ava walked down the aisle – all captured on camera! 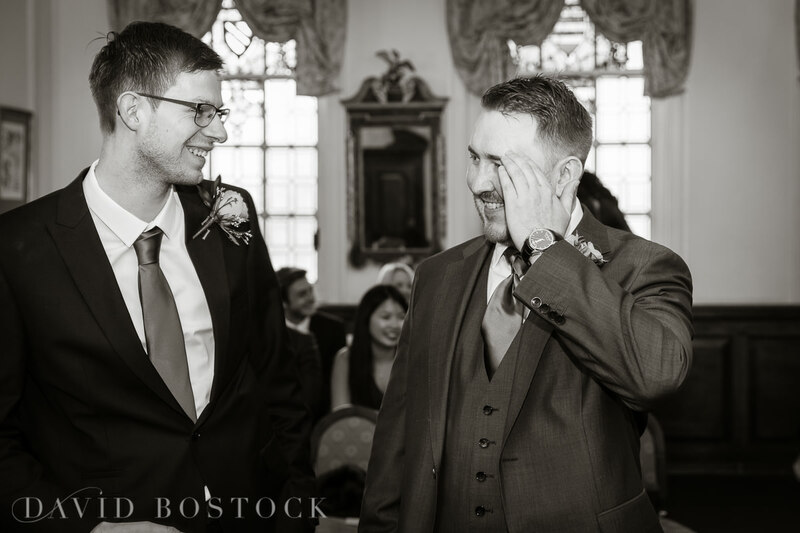 I love the emotion in those photos. 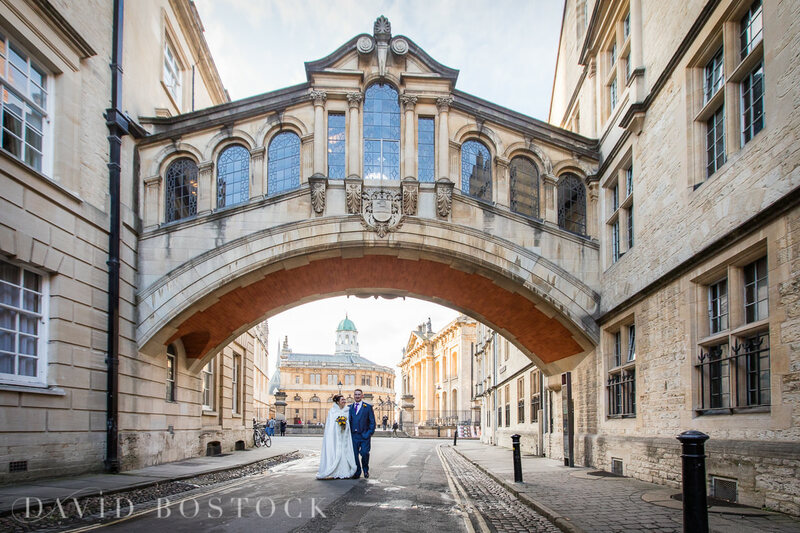 After the ceremony, we made the most of the incredible location and shot lots of different photos in front of some of Oxford’s most iconic landscapes, including the dramatic Radcliffe Camera and famous Bridge of Sighs, inspired by Venice’s Rialto Bridge. 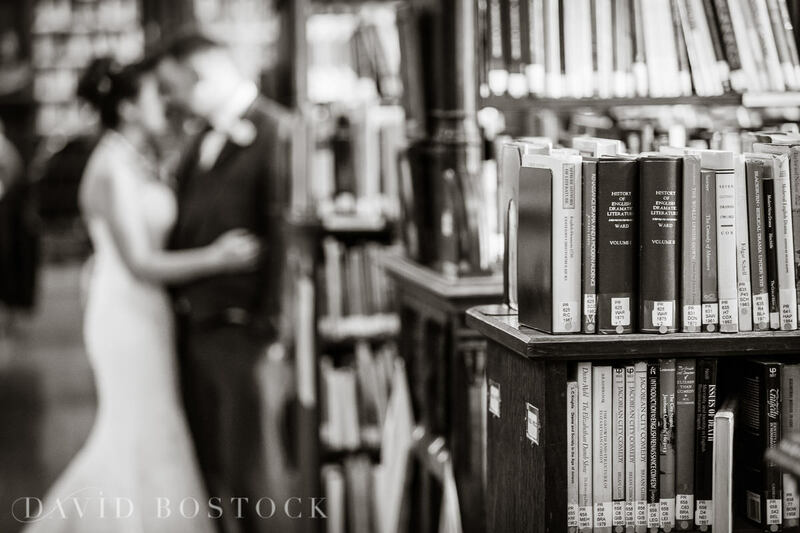 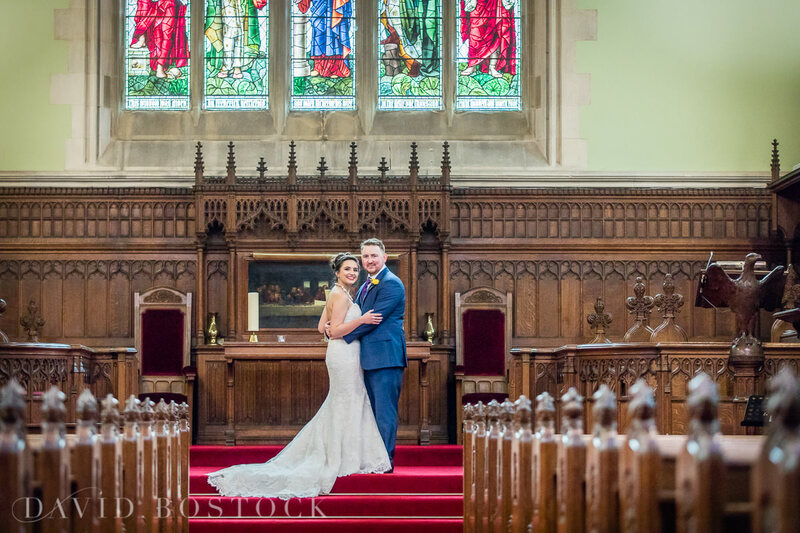 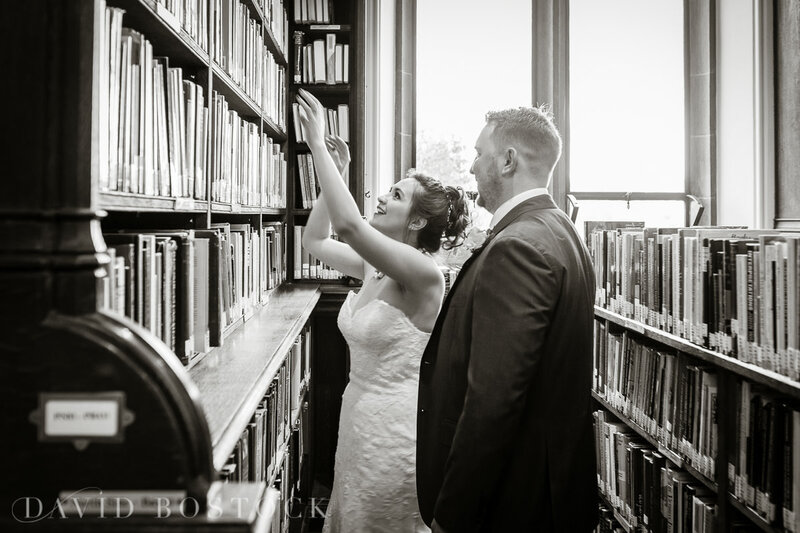 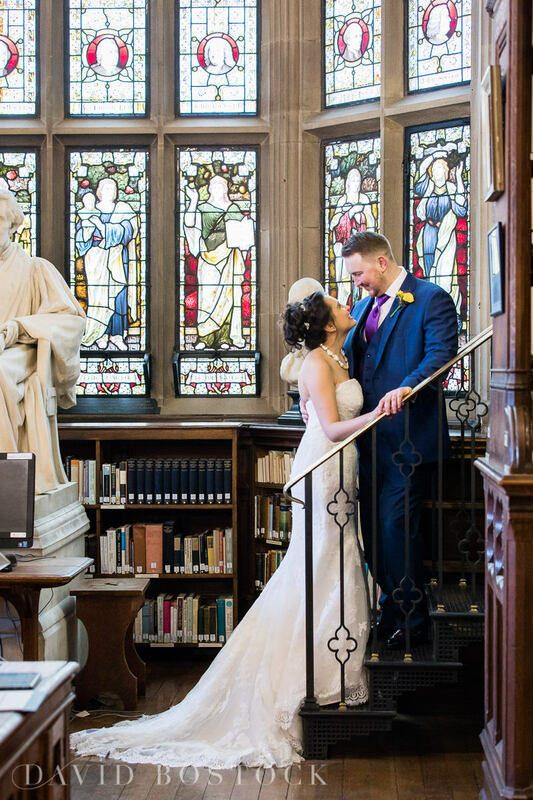 Ava and Filipp were really keen to have some photos taken in the beautiful library at Manchester University College, as Filipp proposed in a library. 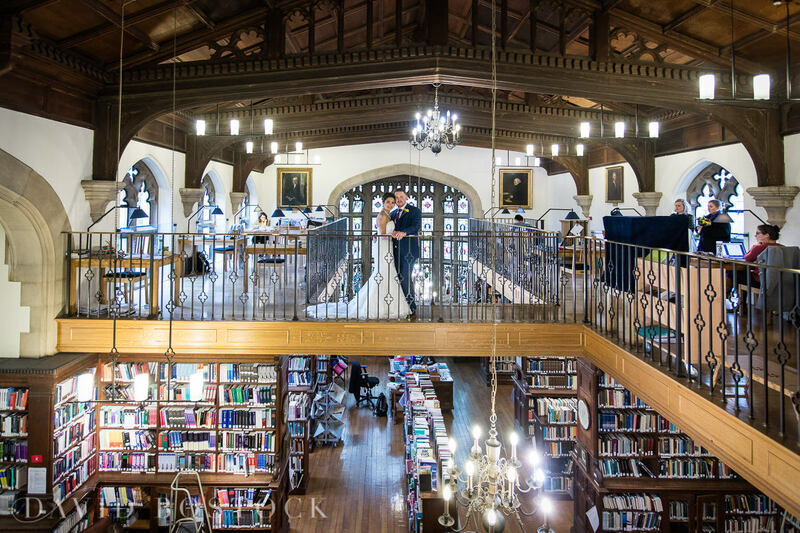 This put all of my photographer skills to the test, as the library was full of students revising for their exams so we couldn’t make any noise. 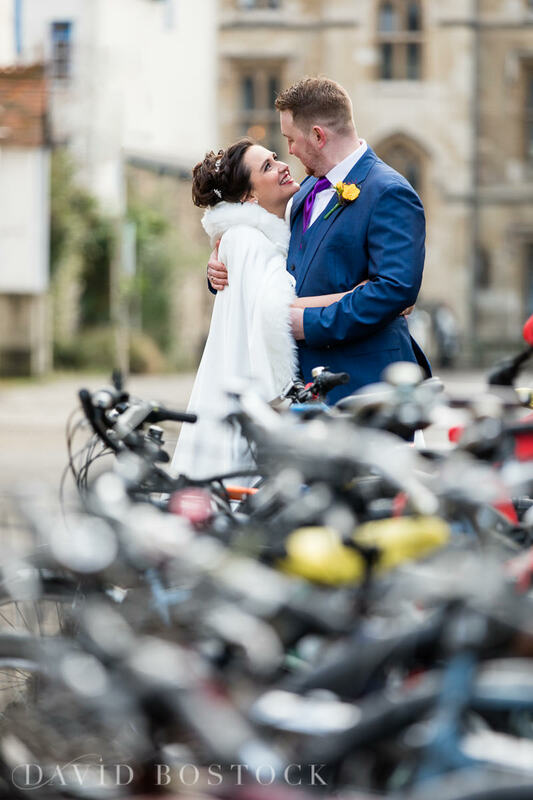 I had to use my own sign language to ask Ava and Filipp to pose in different ways and kiss – very funny and quite hard to keep quiet! 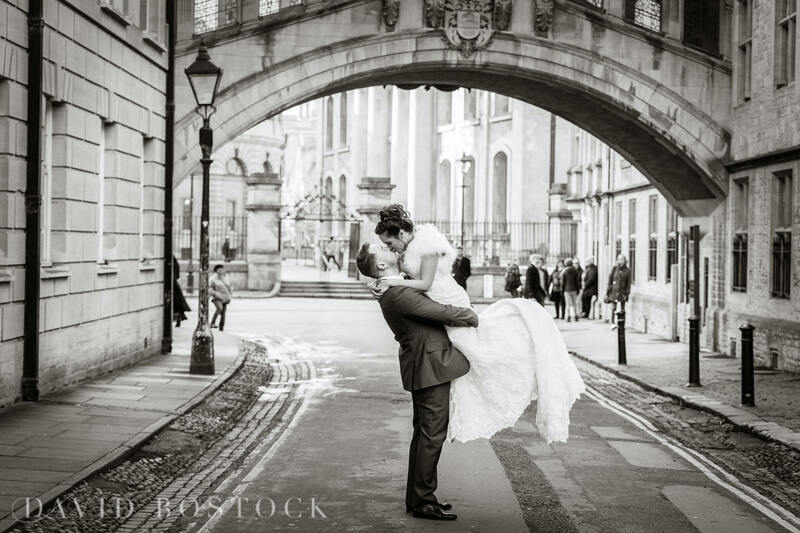 The champagne reception was held at Hertford College (home of the Bridge of Sighs), so we did some photos inside and outside the beautiful chapel that accompanies the college. 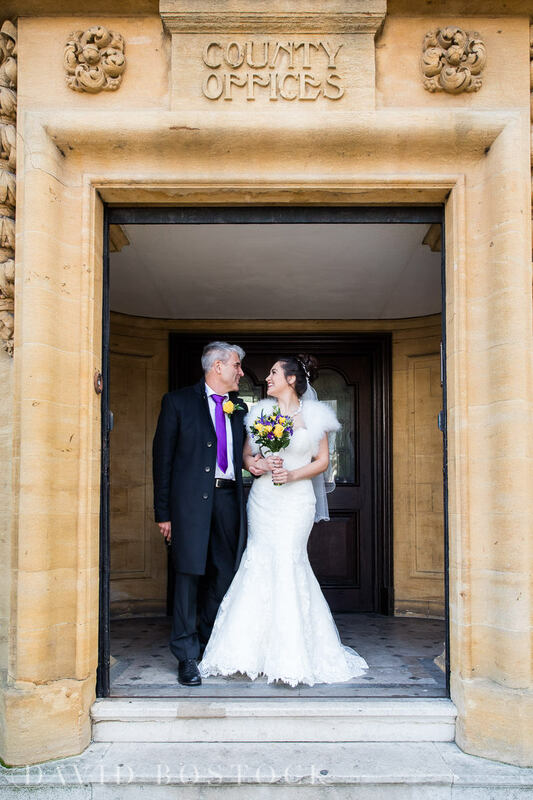 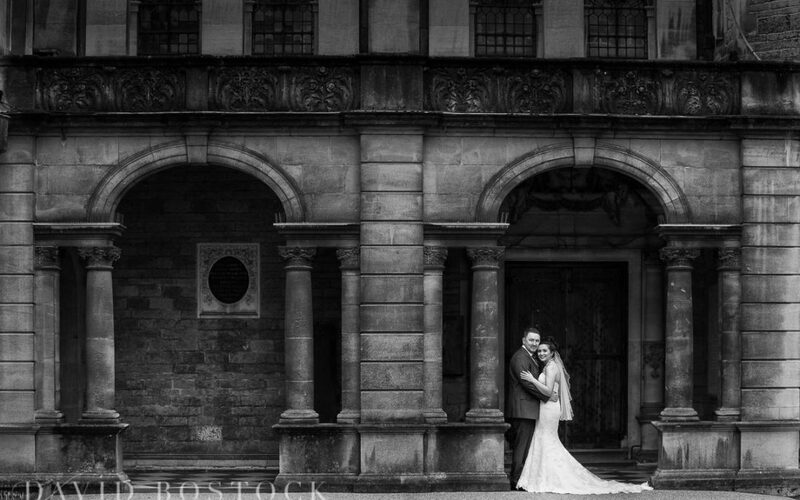 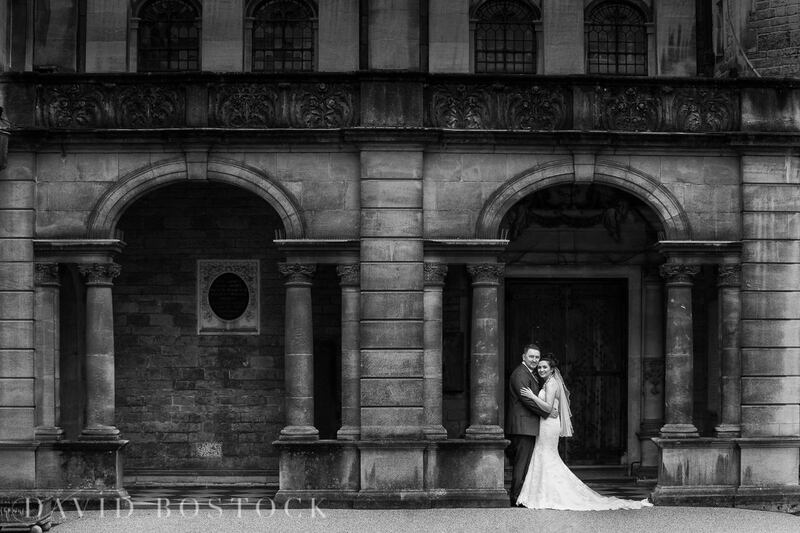 I am so pleased with how well these turned out and recently won Gold in the central region MPA wedding awards in June, for the ‘Wedding Classical’ category, with my shot of Ava and Filipp outside in the archways. 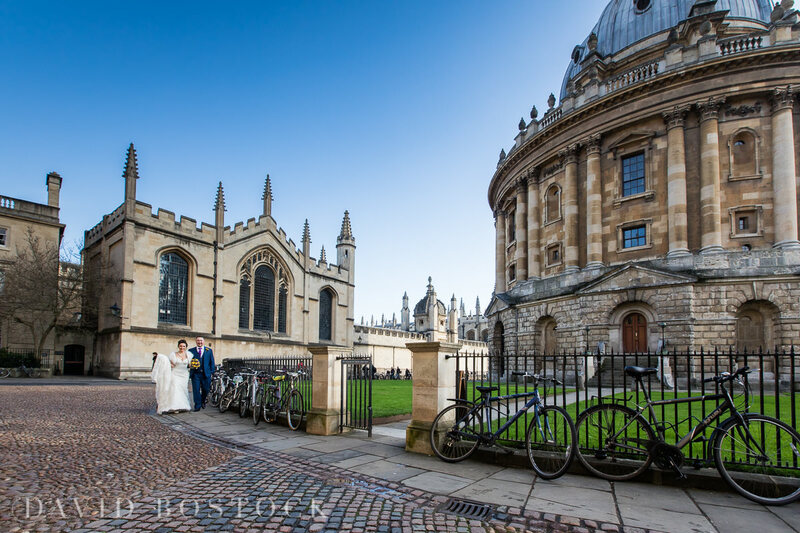 After a walk through the centre of Oxford – with me snapping away, of course! 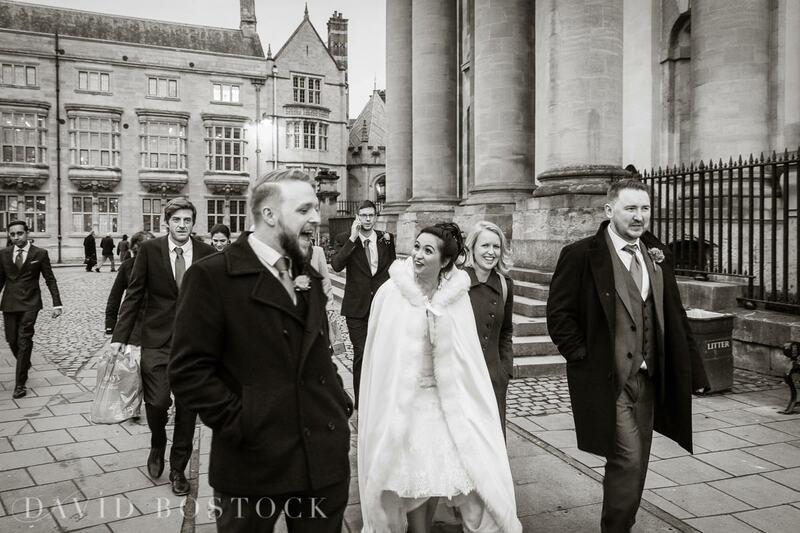 – the wedding party arrived at The Randolph Hotel for the evening reception. 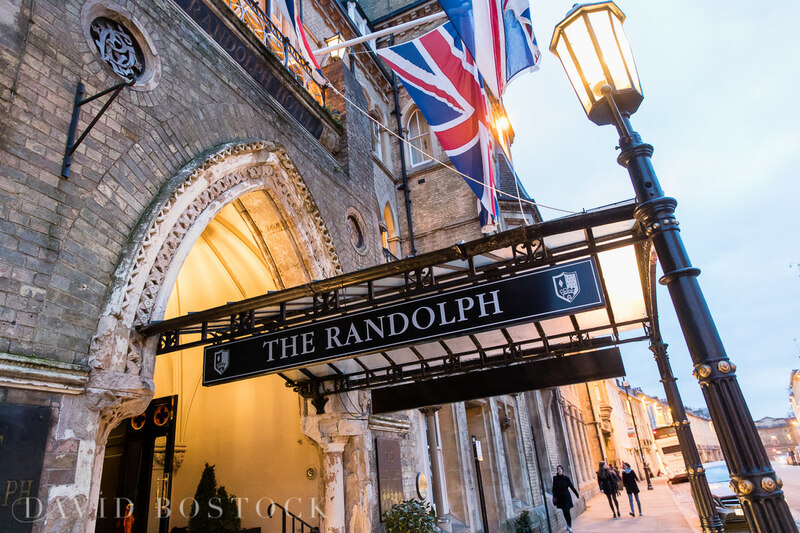 The Randolph has featured in many episodes of Inspector Morse and is home to the iconic Morse Bar. 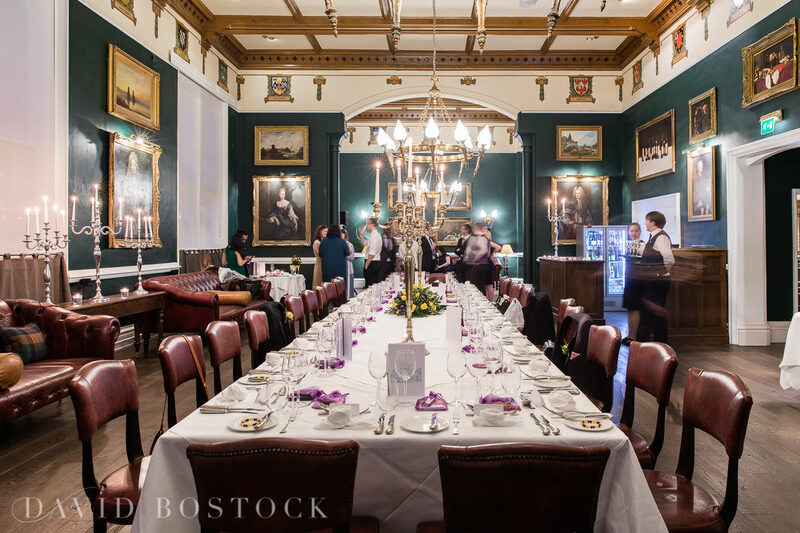 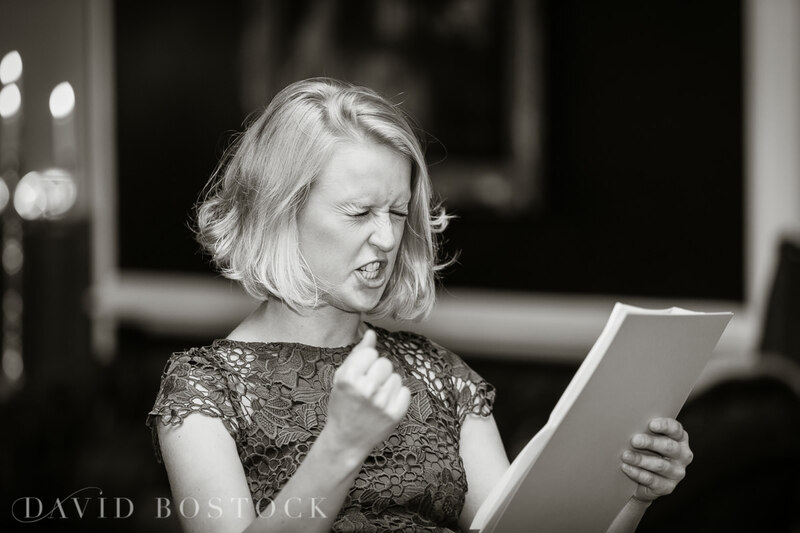 It was the perfect setting for an elegant and intimate meal, relaxed speeches and cosy celebrations. 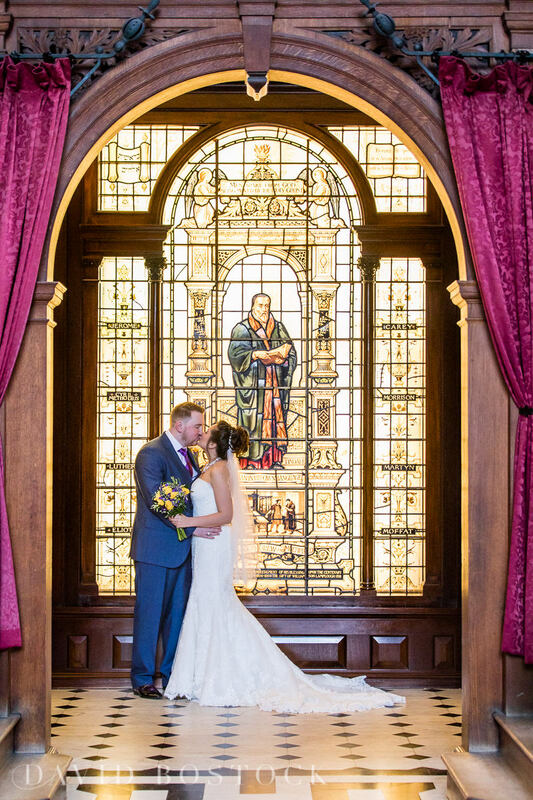 The perfect end to a very stylish wedding day. 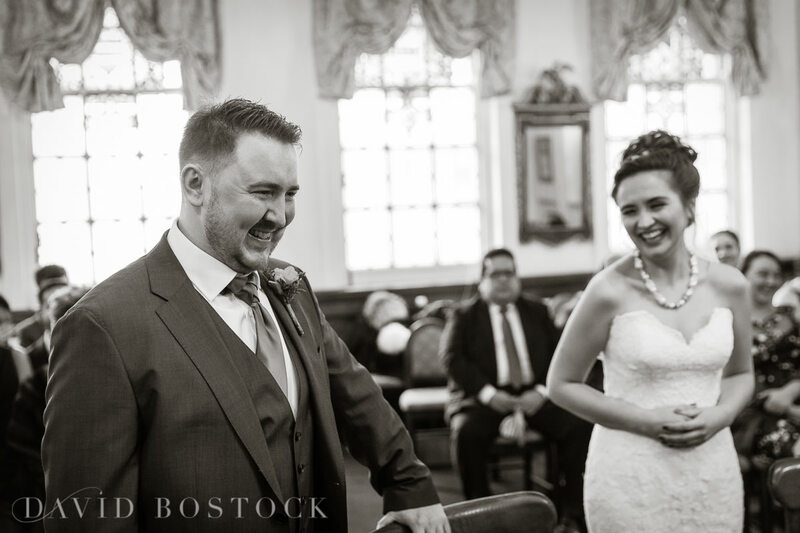 Great set. 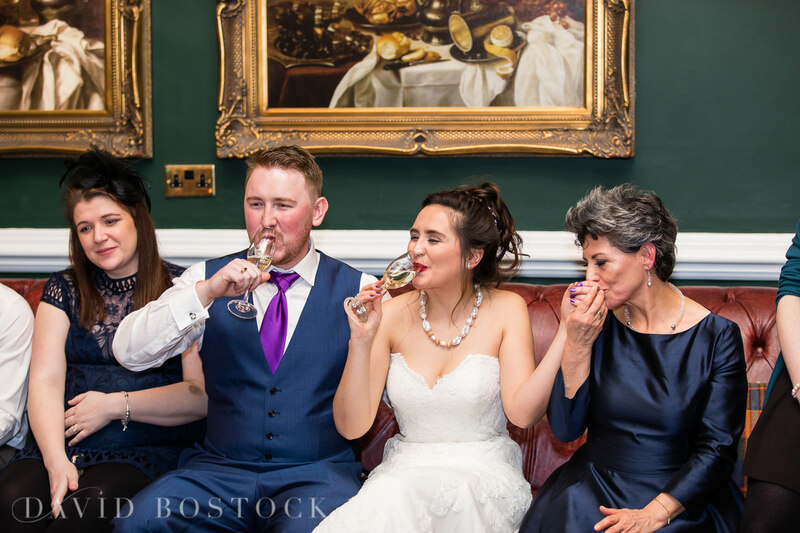 Looked like a fun wedding with lots of variety! 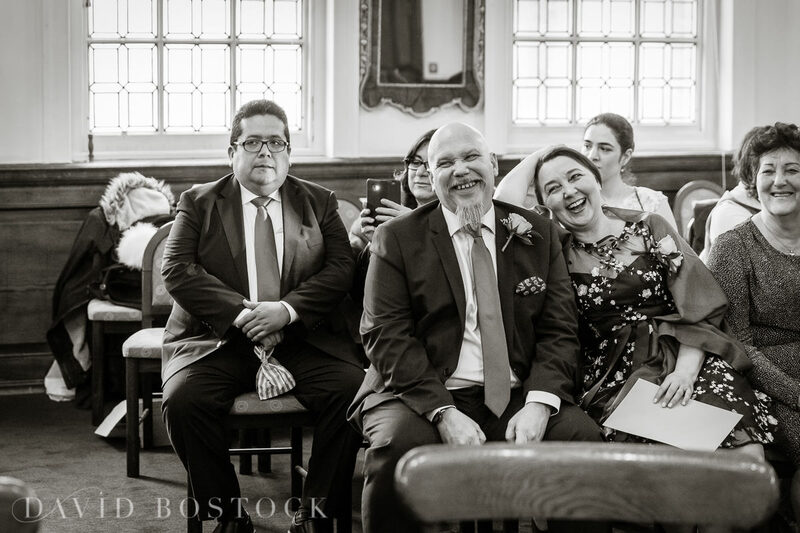 Gorgeous photos David! 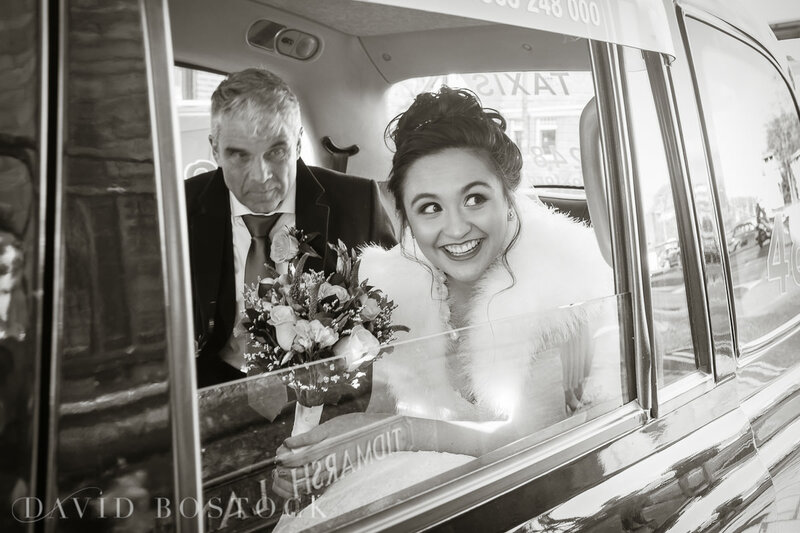 I especially love the one of the bride in the car – just stunning! 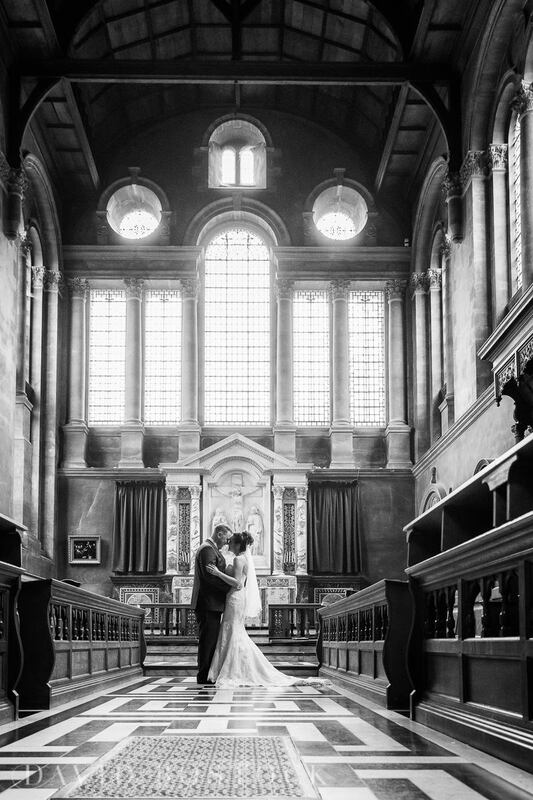 thanks Sara I love that shot too really lots of low sun and contre-jour flare that day for sure!